During the past couple of months it seems that one tragedy after another has befallen Indonesia. In late September, more than 2,000 Indonesians died after an earthquake triggered a devastating tsunami off the coast of the Sulawesi region. Countless more had their lives upended and destroyed. More recently, a jetliner crashed soon after takeoff from Bali, killing all 189 people on board. If there’s anything I’ve learned over the years and in multiple trips to the country, it’s that Indonesians are proud, resourceful, and strong. Our hearts are with the people of Indonesia during these difficult times. In my travels in Jakarta and Manila, I saw firsthand the health and safety challenges local people face every day. Although my hotel room in Jakarta was smoke-free, other parts of the hotel reeked of smoke. It was clear that comprehensive smoke-free laws were badly needed. In Manila, smoking in public places is somewhat less visible, but I had meetings in several buildings where I saw smokers. There’s no doubt: Secondhand smoke and exposure to smoking remain significant challenges in both countries. We know that eliminating tobacco use is the number one way to improve the health of billions of the world’s citizens. Tobacco kills seven million people a year, yet the WHO estimates there are 1.1 billion smokers in the world. That’s why, since 2007, Bloomberg Philanthropies has committed $1 billion toward reducing tobacco use. In both Indonesia and the Philippines, where each year tobacco use claims the lives of 225,700 and 117,700 people, respectively, tobacco control remains a challenging but surmountable public health issue. The Philippines has seen progress in recent years by increasing taxes on tobacco products and implementing graphic health warnings on tobacco packages; however, there is much work to be done. The tobacco industry has challenged local governments through the court system when they plan to implement national tobacco control laws. In Indonesia, cities are leading the charge to reduce tobacco use and exposure to secondhand smoke throughout the country. There is no national smoke-free law, but since 2009, more than 90 million Indonesians are protected by smoke-free laws through subnational efforts. We are seeing significant progress in both countries, but much more has to be done. Road traffic injuries are the eighth leading cause of death globally, but this public health issue doesn’t get the attention it deserves. Nearly 85 percent of the world’s countries lack adequate laws to counter the 1.3 million deaths and up to 50 million injuries every year on the world’s roads. Neither Indonesia nor the Philippines are immune to this threat. In 2015, Bloomberg Philanthropies started a new phase of support for road safety, working in 10 cities and five countries. Bandung, Indonesia, and the Philippines are included in this five-year initiative. In the Philippines, partners and advocates are working hard to strengthen national road safety legislation, particularly around child restraints for children under 12 years old. In Bandung, Indonesia, the city has committed to redesigning dangerous city streets, making them safer for all road users, and has actively engaged in producing hard-hitting media campaigns starting with one to encourage motorists to wear helmets and officials to enforce helmet laws. Everyone I met, whether they were partners in government or non-governmental organizations, acknowledged that more needs to be done, but all were energized by the steps taken and progress to date and are committed to moving forward, together. 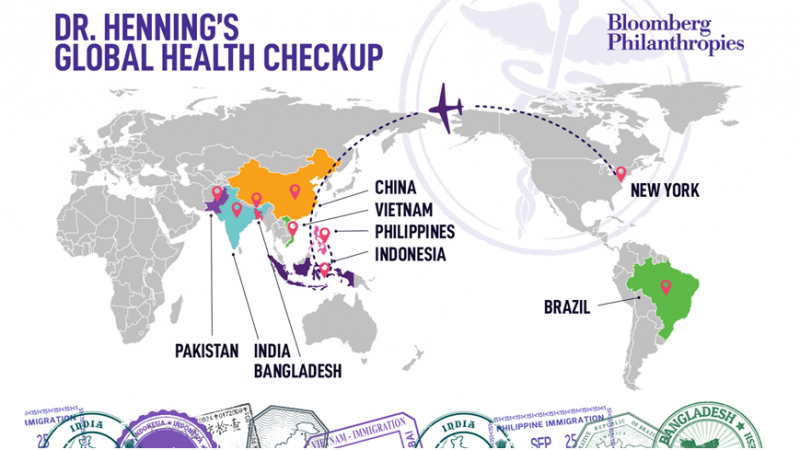 This is the third post in a series by Dr. Henning reflecting on her visits throughout the year to Brazil, Vietnam, China, Indonesia, Philippines, Bangladesh and India to see firsthand the successes and challenges our partners face in tackling noncommunicable diseases (NCDs)and injuries in their communities. Read Part 1: Brazil and Part 2: Vietnam.